Homemade fudge is a holiday staple. A good fudge melts in your mouth. The best fudge melts in your mouth and can be whipped up in five minutes or less. This is that recipe. 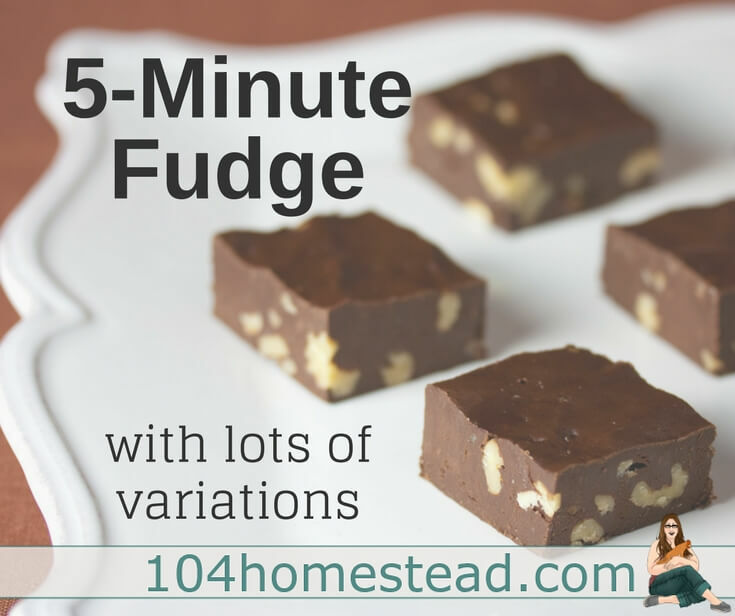 If you’re ready to impress your friends with a unique homemade fudge, look no further. Below you will find many suggestions for things you can add to your Plain Jane Fudge. Place chocolate chips, sweetened condensed milk, vanilla, and butter or margarine in large microwaveable bowl. Zap in microwave on medium in 30 second intervals, stirring each time you check, until chips are melted. Once melted, gently mix in stir-ins, if desired. Pour into well-greased 9×13″ glass baking dish. Refrigerate until set. This homemade fudge melts in your mouth and can be whipped up in five minutes or less. Place chocolate chips, sweetened condensed milk, vanilla, and butter or margarine in large microwaveable bowl. Zap in microwave on medium in 30 second intervals, stirring each time you check, until chips are melted. Once melted, gently mix in stir-ins, if desired (see notes below). Pour into well-greased 9×13″ glass baking dish. The quantities below are merely suggested. Don’t feel like you are committed to choosing just one. Mix and match. Play with ratios. Have fun with it! The very worst that could happen is a batch that maybe isn’t suitable for a holiday party. Snack away on it (because you should never waste perfectly good chocolate) and try again. In ten minutes you can have a party-ready batch. My husband loves a combination of bacon and cayenne. I always eyeball it, but I’d guess I add about 6 strips of bacon and 1 heaping 1/4 teaspoon of cayenne. If you’re wondering about peanut butter, I prefer to keep the layers separate and not mix peanut butter in my homemade fudge. Instead, I make my own Peanut Butter Cups. They take longer, but are worth the wait. And speaking of time, if you are on a time crunch to get desserts on the table, you might also appreciate this list of 22 Quick & Easy Dessert Ideas that can be made in an hour or less.